Thank you for your continued support and prayers. Despite a global economic crisis, I expect that by now signs of the Christmas season are beginning to emerge. Christmas is Zambia is a little different, a much lower key affair. There are few decorations in shops or homes and there is no tradition of celebrating with a special meal or presents. We are, however, still united by celebrating the coming of the Messiah and Zambian Christians generally think their relationship with God is fundamental to their lives. 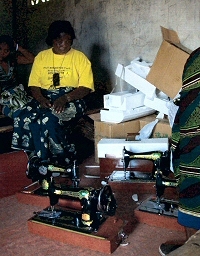 The sewing machines have arrived and are being unpacked by the ladies in Ipusukilo, Zambia. They are thrilled with the arrival and are waiting to start the tailoring course sometime soon. You can see some of the machines in this picture. During these past few months my visits to the compounds have been focusing on matters to do with nutrition. 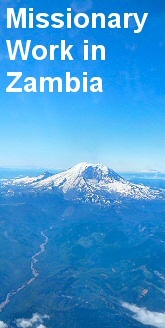 Although an education is paramount to most Zambians, there is still room for teaching some guidelines. I hope you will join me through your prayers as I struggle to remind and inform the groups in Kamatipa and Ipusukilo about some of the basics of nutrition and hygiene. The traditional staple food nshima (which is cooked to a doughy paste and eaten with boiled vegetables), is plentiful, but of little nutritional value beyond carbohydrates. Meat here is more expensive than in the UK (I can pay the equivalent of £3 for a small packet of mince) so most people in the compounds use Chikanda, a sort of peanut pate or occasionally chicken for their source of protein. Preserving food in this hot climate, especially if you have no electricity, can be a problem. I have used the hot dry season to sun dry tomatoes, and have shown both groups how to do this. The Kamatipa group has been growing tomatoes, but there is a glut on the market at the moment and prices are low. There is not much return for all their effort. I have been experimenting with home made ketchup as a way of using ripe tomatoes before they become un saleable. I have also found a practical way of making Soya milk out of Soya beans. This, if I can source enough beans, will be particularly useful to nursing mothers who are HIV positive. They are advised to stop breast feeding a child who is not HIV positive at around 6 months when they begin taking solids, as that is when the risk of contacting the virus increases. One little chap, Dan, whose mum used to visit the Ipusukilo group occasionally, got sick and died because of his mum, being unusable to afford formula or milk, was feeding him a thin nshima porridge and giving him water in his bottle. After some advice she began to add groundnuts or Soya flour to his porridge to increase his protein intake, but sadly it was not effective enough. In another incident just a couple of weeks ago, Charity told me about her near neighbour in Chimwemwe compound who lost her baby and her toddler within a week of each other through vomiting and diarrhea. A heartache I cannot imagine. The greatest tragedy to me, is that at home in the UK these deaths would have been entirely preventable; and even given our conditions in Zambia, a bit of basic knowledge about nutrition and hygiene would have meant a different outcome altogether. The wealth of knowledge we from the developed world hold, but are unable to get across - despite our vast resources and an eager willingness to learn on the part of the Zambians - frustrates me greatly. My prayer request for myself in this newsletter is for clarity of thought and skillful communication so that these people can gain the knowledge and confidence they need to prevent such tragedies happening in the future. Peace and a smooth transition to a new government after the elections at the end of this month. Success for the self help literacy project in Kamatipa, the tailoring venture in Ipusukilo and other income generation projects. Calm and sanity to prevail in the growing tensions between our neighbour the Democratic Republic of Congo and Rwanda. The participants successful graduation in their various Diploma subjects. Mindolo reaching its Golden Jubilee year. The work done by friends who have recently left, or are soon to leave Mindolo, in particular Adrian, Rachel and Carmen.